The adage goes that it is sometimes more fun to drive a slow car fast than a fast car fast. You know, cars that seem to go fast while in fact going slowly. With that in mind I had a look through my garage to see which of my cars best fit the bill. There was my 1937 Fiat Topolino. It has 13.5 horsepower and a top speed of 52mph. The speedometer reads in kilometres, so 50mph is 80km/h, but the sensation behind the wheel is more like 80 miles per hour! Believe me, bobbing up and down at 50mph in a car with tiny wheelbarrow-sized wheels and tyres and rudimentary suspension can be frightening. Just trying to keep control as the girl in the lane next to you in her Honda Civic is texting and applying lipstick while maintaining the same speed. The next to grab my eye was the Morgan three-wheeler. It has a 998cc two-cylinder JAP engine, sounds like a Gatling gun at full pelt, and gives a ridiculous sense of speed as it is just inches off the ground. Toyota Camrys loom like trucks as they pass you. I know, because I often end up reading their hubcaps at eye level. One day I'm on Mulholland Drive in the Morgan, scaring myself silly, throttle wide open, and I come around a corner, rear end sliding. Just as I straighten out I see an LA policeman with his radar gun. It's aimed right at me so I figure he's got me so, as I pass him, I pull over and I wait. And wait. And nobody comes. Speed limits originate from our perception of speed. When they came up with the highways here in America, people were taken for a ride in a modern car with a blanket over the speedometer and the driver would ask the passengers to say when it felt uncomfortable. And 65mph was what most people said felt fast. And that's sort of how they came up with the speed limit. Till the day my dad died, he'd say Slow down, you're going a mile a minute!' I'd say Dad, we're in the F1 McLaren. We're doing almost three miles a minute'. A mile a minute to him was fast. There is 110 reason for anyone to go over 18mph. Being a speed demon proves nothing!' It says that in the manual for the 1907 White steam car. You sit maybe six feet off the ground in the White, with no windshield. So 40mph seems fast enough. You get a real sensation of speed and the steam engine has so much torque. Now let's go to the ultimate in slow vehicles that scare you silly. I have a machine that is the most extreme example of frightening low speed. It is a 1906 Advance steam tractor. It weighs 13 tons, requires 250 gallons of water and. once you start the process of firing it up. It takes 90 minutes to pull away. It's been converted to run on propane because shovelling coal can get tiresome. It has steel wheels about 6 feet tall, which I've put rubber on so as not to tear up the road too badly. It's a steam tractor, used to plough fields. The guy I got it from had it at a tractor pull and he pulled 55,000lb with it. That's about 27 tons. On a sled. The steering is by two massive chains, pulling to the left or the right. It takes two people to drive it, one to steer and one to work the throttle, clutch and brakes. Actually there are no brakes. What you do to stop is shut off the throttle, disengage the clutch, put it in reverse, let the clutch out and shudder to a halt. Some of my favourite cars are hybrids, I’ve realised, but they’re not the ones you’re probably thinking of right now. I come from an era when the word ‘hybrid’ meant something totally different. And last week I finally found one. I had my heart set on an Aston Martin DB5, but I just can’t bring myself to justify the price. It’s not that I don’t think it’s worth it, it’s just that I grew up in an era when used DB5s were just a few grand more than an #Jaguar-E-type . The car I’m talking about is much rarer than a #Aston-Martin-DB5 . I think they made fewer than 500 of them. It’s a car that has fascinated me for some time, probably because I never actually saw one in person. Then, about a year ago at a car show in Beverly Hills, I finally did see one. It was a deep royal blue with a tan interior, just the combination I would have ordered back in 1965 when it was new. But at the time I was 15 and working at McDonald’s. I did hear that Sean Connery, probably the biggest movie star in the world at the time, had one. Years later Sean was a guest on my talk show, I asked him about the car and he seemed pleased I knew what it was. Turns out he actually passed over a #Aston-Martin DB5 for a second-hand #Jensen-C-V8 / #Jensen . True enthusiast, or just a thrifty Scotsman? Well, that made me want one even more. Anyway, back to the Beverly Hills car show. Showing the Jensen was a German guy named Chris. I introduced myself and told him how much I liked his car. He smiled broadly and seemed thrilled that I knew what it was. Most people at the show had no idea. ‘What year Jensen-C-V8 ?’ I asked. ‘It’s a 1965 Mark III,’ he replied. To my mind the final Mark III was the most desirable version. Even though this was exactly what I was looking for, I never ask people at car shows if something is for sale or how much it costs. I hate when people do it to me because it just seems so incredibly rude. Chris and I chatted for a few more minutes, I complimented him on the restoration and wished him good luck. Not quite a year later, my next-door neighbour called me to tell me a friend of his had a car for sale, and was I interested? Normally when people call me with a car for sale, it’s something like an AMC Gremlin with a Levi jeans interior. ‘Do you remember meeting a German guy at the Beverly Hills car show last year?’ my neighbour asked. ‘You mean the guy with the C-V8?’ I replied. ‘Yeah, that’s him,’ he said. The car was less than five miles from my house. I ran out the door and bought it on the spot. No, I didn’t test drive it first. No, I didn’t put it up on a ramp and look it over like you’re supposed to do. Do you know why? Try and find another one! Luckily the car turned out to be just fine; a few small things but nothing major. The car is called a hybrid because, back in the ’60s, ‘hybrid’ meant putting American power plants into European cars. Think early Cadillac-powered Allards, or Carroll Shelby stuffing a 289 Ford into an #AC-Ace to create the Cobra. That started a trend of sticking very powerful American engines into English cars. Jensen used a #Chrysler-383ci-V8 , sending over 330bhp through a three-speed Torqueflite automatic transmission. I like to think of my Jensen as a #Dodge-Dart-GTS that went to Oxford. The reason I’m partial to English hybrids is that I love English styling, design and roadholding, and I understand American engines with their torque and durability. It seems the ideal combination to me. The Jensen is everything I wish my GTS could be. Four-wheel disc brakes instead of disc/drum. Classic British wood and leather interior, instead of plastic and vinyl. Sophisticated chassis with rails acting as a vacuum reservoir, to aid braking. It even has shock absorbers you can adjust from the driver’s seat. My GTS shares its body with the six-cylinder runabout model, but the Jensen has a fabulous (to my eyes) custom body made of fibreglass. Combine all this with a 130mph top speed, and you have to wonder why it’s a tenth the price of a DB5. I think there may be a snob factor involved because of the American power. I love this era of hybrids. I also have a Monteverdi, a Swiss car with a Chrysler 440, a four-speed manual and a two-door Frua body from Italy. It was bought new, right off the floor, at the Geneva show where it premiered in 1970. I bought it, years later, for less money than the Dodge Challenger with the same engine and transmission made at the Barrett-Jackson auction. Not all hybrids are bargains, as the Cobra proves. Yet a #Gordon-Keeble , a #TVR , a #Sunbeam-Tiger , a #Bristol-407 – if you ever see one of those for a reasonable amount of money, grab it! Because a lot of people read this magazine. The greatest thing about our passion is the fact that it’s only about 150 years old. If we were all Bible scholars, instead of petrolheads or gearheads, we’d be spending our days poking around in the searing heat out in the desert somewhere. Instead we get to go to cities like Modena, Stuttgart, Detroit and Paris. Or even Woking. When I was a teenager my life was muscle cars. I used to feel sorry for people who grew up in the 1920s and ’30s because cars seemed so slow back then. But the more knowledge I gained, the further back I wanted to go. That’s the reason I got interested in steam. I wanted to know what came before the internal combustion engine. Steam ran the world from the 1800s until the opening decade of the 20th Century, just as the internal combustion engine ruled the world from the 20th Century to the dawn of the new millennium. Sure, the internal- combustion engine is still around, but the writing is on the wall. A child born this year will most likely not ride in an internal-combustion vehicle as an adult, just like most kids in America today have never been in a manual-shift car. I now realise that every decade had its supercars. In 1906 Fred Marriott, driving a Stanley Steamer, set a world land speed record of 127.6mph on the beach at Daytona, Florida, that record stood for 103 years as a steam car’s peak speed achievement until it was broken by a British three-ton, two-stage turbine-driven steam car which only went a hair over 20mph faster - over 100 years later. Another early supercar I lusted after, and was fortunate enough to acquire, was the 1918 Pierce Arrow Model 66. The Pierce 66, as it was popularly called, still holds the distinction for being the largest production engine ever put in a car. It has six cylinders with a total displacement of 825 cubic inches, that’s 14 litres. The pistons are the size of paint cans and the engine has three spark plugs per cylinder. It needs three spark plugs because the combustion chambers are so huge, the bore is 5in, the stroke is 7in and the wheelbase is 147.5in. Horsepower is rated conservatively at 125. This car is a torque monster. One time when I was pulling away from a traffic light I thought to myself, it feels a bit sluggish, then I realised I was in fourth gear. The twilight of the 1920s brought what has to be the greatest American classic of all time, the Duesenberg Model J. A straight-eight, twin-cam, 7-litre masterpiece, with four valves per cylinder and 265bhp. Or 320bhp when fitted with the optional supercharger, this was at a time when 100bhp was considered exceptional. It was also the first American car to be fitted with four-wheel hydraulic brakes. Between the braking, the horsepower and the handling, it’s one of the few cars of the 1920s that you could actually drive today in modern traffic with no problem at all. Assuming, of course, you have massive biceps and a strong left leg. Another thing you learn when you study automotive history is that there is really nothing new under the sun. Four-valve heads, twin cams, hemispherical combustion chambers, even hybrid cars are nothing new. All these things existed before the First World War. One of Ferdinand Porsche’s first cars was a hybrid: the 1899 Lohner Porsche, which was front-wheel drive and had its electric motors in the front hub. 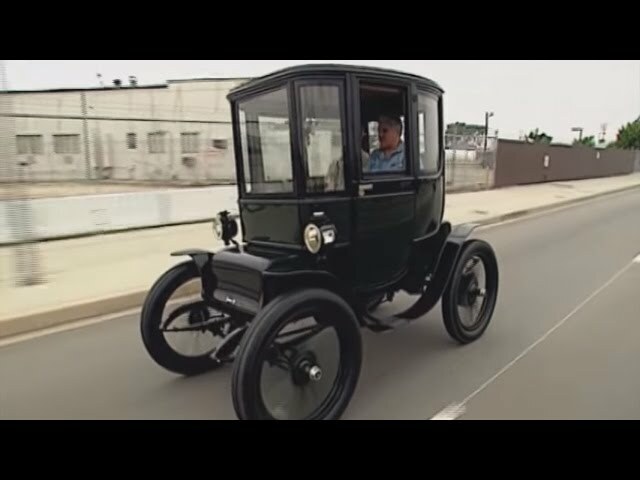 And since battery technology was still in its infancy, he had two small gasoline engines directly powered to a generator, providing the electricity to the front wheels. Sounds like the future, doesn’t it? When I was a teenager, the King of the Hill was the Chrysler Hemi - a massive V8 with two four-barrel carburettors and an unheard-of 425bhp. It really ticked all the boxes, the one I have is in a 1970 Dodge Challenger with a four-speed transmission and the hilarious pistol-grip shifter. It’s painted Hemi orange with a black vinyl roof and matt accents on the hood. It handles like a bowling ball on a waterbed but that doesn’t matter because it goes like stink in a straight line. Or it seemed like it did, back in the day, when 0-60 in 6.3sec was as good as it got. And 13.1sec quarter-mile times were all it took to beat everything else out there, all the while getting nine miles to the gallon. On a good day. Unfortunately, today driving a ’70s muscle car is like walking around with a rolled-up sock in your pants. It looks impressive until a kid in a hot hatchback blows your doors off while still getting 30 miles to the gallon. In this era of McLaren-P1s, Corvette ZR1 s, Bugattis and Koenigseggs, there are probably kids now looking back at my era and feeling sorry for me. Why? Because cars were so much slower then. 2015 McLaren P1. McLaren CEO Mike Flewitt visits the garage to walk Jay through his new P1, one of only 375 made, and the first on American soil.